What is the best way to ship art so that every single piece arrives at its destination in perfect condition? Right, you need to hire a professional fine art shipping company for this responsible job! At Fine Art Shippers, we are proud to offer premium quality customized art logistics services based on individual needs of our clients. Moreover, we can provide you with the best way to ship art not only across the United States but also worldwide, not to mention that Fine Art Shippers is the right choice if you are looking for the best way to ship art to or from the international exhibition. For example, this past December, we spent an amazing time helping artists, dealers, and collectors with art logistics during Miami Art Week 2018. Besides, we also had a chance to visit many incredible galleries participating in different art fairs held in Miami and Miami Beach. In particular, our team was pleased to visit Maddox Gallery at Art Miami 2018. Maddox Gallery is all about exclusive and cutting-edge modern and contemporary art. For today, this well-established international gallery has several locations in London and also beautiful exhibition spaces in Gstaad and Los Angeles, each featuring an outstanding selection of art in various mediums, from painting to photography. Moreover, Maddox Gallery is dedicated to showcasing the work of Blue Chip artists like Marc Chagall, Andy Warhol, Roy Lichtenstein, Pablo Picasso, Jean Michel Basquiat, and Gerhard Richter. Besides, Maddox Gallery represents such contemporary talents as Bradley Theodore, RETNA, David Yarrow, and Mr. Brainwash, showcasing their innovative works at many important exhibitions throughout the world. 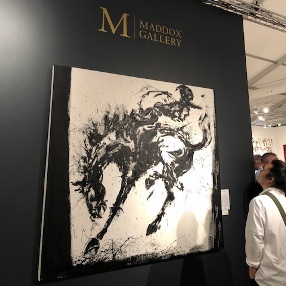 At Fine Art Shippers, we were delighted to visit Maddox Gallery at Art Miami and get acquainted with the gallery’s truly amazing selection of contemporary art. Highly recommended!